Setup mode is entered when JumpIt is first started and whenever the button ‘Restart‘ is touched. Game piece. Can jump over or be jumped by another game piece. When you are through setting up your game, touch the ‘Start’ button. At anytime while playing you can enter setup mode (restart a new game) by touching the ‘Restart’ button. Select the game square that is empty by touching the desired game square. 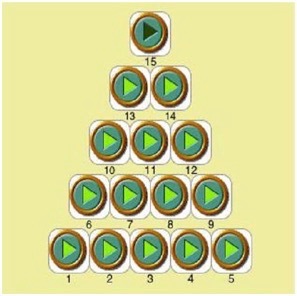 Select the shape of the game. Touch the button 'Change Game Shapes' to have a drop down list appear with the available game shapes. The button's text is changed to 'Hide Game Shapes'. Touch the 'Hide Game Shapes' so the drop down list will go away. ￼JumpIt is a fun game with the objective to finish the game with one game piece left. The game is started with one game square being opened. You then jump one game piece over another into the opened game square. The game piece that is jumped over is then removed from the game board. You continue jumping over game pieces until there is only one game piece left. You can only jump over one game piece per move. Challenge your self with how fast you can win the game (the time is displayed when the game is won), or use a different game shape. You can even specify which game square starts off empty. A game piece cannot jump over more than one game piece.